We develop, manufacture and distribute high quality branded beverages throughout the world. From Waters, Sodas, Juices, Ice Coffee/Teas, Beers and Wines to Liquors. Global Brews continues to create, grow and establish innovative new brands for the beverage consumer worldwide. Motörhead are an English rock band formed in June 1975 by bassist, singer and songwriter Ian Fraser Kilmister, professionally known by his stage name Lemmy, who has remained the sole constant member. The band are often considered a precursor to, or one of the earliest members of, the New Wave of British Heavy Metal, which re-energised heavy metal in the late 1970s and early 1980s. TROOPER takes its name from the Iron Maiden song which is inspired by the famous Charge of the Light Brigade. Being a real ale enthusiast, vocalist Bruce Dickinson has developed a beer which has true depth of character. TROOPER is a Premium British Beer inspired by Iron Maiden and handcrafted at Robinsons brewery. Malt flavours and citric notes from a unique blend of Bobec, Goldings and Cascade hops dominate this deep golden ale with a subtle hint of lemon. The “Imperial” indicates that it is an amplified version of the original beer style. Generously hopped with Amarillo, Cascade, Centennial and Simcoe hops, it pulls toward an American take of the lager-beer. While being a fruity lager with a huge hop character, it still has a high drinkability. Scotch Ale is a style of beer originating from Scotland, where beers are often characterized by heavier, bolder brews. Grale is based on six different malts, with both Wiener and Pilsener malt in the mix, before it sees the addition of four different hops; El Dorado, Citra, Magnum Fuggles and Amarillo. Ghost is a Swedish heavy metal band that was formed in Linköping in 2008. Ghost are easily recognizable because of their eccentric on-stage presence. Five of the group's six members wear hooded robes and the vocalist appears wearing skull make-up and dressed as a "demonic anti-Pope". The band's members keep their identities secret and their names have not been publicly disclosed; the vocalist calls himself Papa Emeritus and the musicians are referred to only as Nameless Ghouls. Grale Lincopia IPA is a pale IPA, with a strong citrus and orangetinged hop-aroma, and is light and crisp. The style of beer is characterized by well defined hop notes, high bitterness and a crisp flavour. Lincopia is brewed on Pilsner, Münchener, Wheat and Caramel-malts. It’s hopped in several stages where Galaxy, Simcoe, Waimea and El Dorado are added to the worts, and then dry hopped with further El Dorado, Galaxy and Simcoe hops. Slayer is an American thrash metal band formed in Huntington Park, California, in 1981, by guitarists Jeff Hanneman and Kerry King. Slayer rose to fame with their 1986 release Reign in Blood, and is credited as one of the "Big Four" thrash metal acts, along with Metallica, Megadeth and Anthrax. Slayer has never publicly revealed its worldwide sales, however between 1991 and 2004, the band sold more than 3.5 million albums in the U.S.
“TROOPER 666 is the same award-winning TROOPER recipe but brewed to a higher gravity,” explains TROOPER Brand Manager John Robinson. The result is another wonderfully authentic beer that is packed with malt but slightly sweeter than the original. It has a dry finish and is remarkably moreish. Born To Lose IPA is a boldly aggressive West Coast-style IPA, befitting of the band's loud, aggressive style. The 6.5% IPA is brewed with Cascade, Simcoe and Citra hops that provide an earthy, resinous aroma with notes of fresh citrus. In an ode to MOTÖRHEAD's British roots, the beer was also brewed with Maris Otter, a premium British malt that brings a sweet balance to the beer's bold bitterness. The can features an original design of band members in a dystopian "Born To Lose" future from Los Angeles-based artist Jack Gregory. Live to Win IPA is the second release from San Diego, CA brewery Amplified Ale Works, in honor of the legendary band and the iconic front man, Lemmy Kilmister. It is the follow up beer to “Born to Lose” IPA the first Motörhead collaboration beer released earlier this year by Amplified Ale Works. Through-and-through “Live To Win” is a salute to Lemmy Kilmister. Much like the man himself, this beer has its own unique style and is atypical of a classic IPA. “Live to Win” has a hazy unfiltered look, unlike your typically clear IPAs. Dry-hopped with Citra and Bru-1 hops for restrained bitterness that allows tropical flavors to shine through, “Live To Win” complements the warmer climate of Los Angeles, where Kilmister preferred to live. In honor of the country that gave birth to Motörhead, “Live to Win” was brewed with a premium British malt along with additions of wheat and oats to give it a rich, smooth mouthfeel. “Live to Win’s” can artwork was illustrated by Jack C. Gregory and was inspired by Kilmister’s favorite hangout, The Rainbow Bar & Grill on LA’s famous Sunset Strip. The counter to “Born to Lose’s” dystopian future illustration, “Live to Win’s” can art features key people who were a positive force in Kilmister’s life including his Motörhead bandmates Mikkey Dee and Phil Campbell, the late Ronnie James Dio, Dio’s wife Wendy, manager Todd Singerman, and the generational owner-operators of the Rainbow Bar & Grill, the Maglieri family. If heaven exists, it’s Lemmy sitting at The Rainbow surrounded by friends and holding a drink in his hand, because he truly lived to win. TROOPER RED ‘N’ BLACK Porter is the first dark beer in the TROOPER ranks and a modern take on a recipe dating back centuries. Named after a track from the latest Iron Maiden album ‘The Book Of Souls’, the red and black colour comes from the blend of chocolate and crystal malt which gives this full bodied beer a roasted malt and caramel backbone. The special Robinsons’ yeast provides hints of both liquorice and honey character to create a delicious warming brew. Designed yet again by IRON MAIDEN vocalist Bruce Dickinson and Robinsons' Head Brewer, RED ‘N’ BLACK takes its inspiration from an original Robinsons’ recipe from the 1850s, a time when porter style beer was becoming increasingly popular in Britain. Wardance is a unique and drinkable Pale Ale, inspired by the thrash metal band Anthrax and brewed by Butternuts Beer. Their music isn’t watered down and neither is this beer. It’s medium-bodied and amber-colored, with rich foam and a bit of bitterness at the end. Like all great things, Anthrax and Wardance are both made in NY. Take a swig –it’s so smooth it’ll leave you begging for an encore. Anthrax is an American thrash metal band from New York City, formed in 1981 by guitarist Scott Ian and bassist Dan Lilker. The group was considered one of the leaders of the thrash metal scene during the 1980s. Of the "Big Four" thrash metal bands (the others being Metallica, Megadeth and Slayer), Anthrax were the only band from the East Coast. As of April 2017, the band has released 11 studio albums, several other albums, and 26 singles, including collaborating on a single with American hip hop group Public Enemy. Only Motörhead could name a premium cider Snaggletooth. This unique sweetened dry British apple cider is crafted with a juice blend of the finest Dabinet, Michelin and dessert apple varieties to give a perfectly balanced, refreshing taste. Created in tribute to and in celebration of the loudest rock music on the planet. Snaggletooth Motorhead Cider packs a real punch. A classic English Ale from the classic English band, Status Quo. Two legends collide to produce a beer for drinking all over the world. Inspired by the re-release of Piledriver, the first album produced by themselves. Quo have created their first beer with Wychwood Brewery. A traditional malty amber ale balanced with a bold fruity hop character. Status Quo are an English rock band whose music is characterized by their distinctive brand of boogie-woogie. The group originated in The Spectres, founded by schoolboys Francis Rossi and Alan Lancaster in 1962. After a number of lineup changes, the band became The Status Quo in 1967 and Status Quo in 1969. Dog of Two Head, a chestnut amber traditional ale, with a modern citrus twist delivered by the British hops. This is a subtle ale deftly uniting and balancing the influences of malt, hops and natural bitterness. ‘Dog’ is created by Hobsons brewers from British malting barley, and a blend of UK-grown Fuggles, Challenger, Goldings and Progress hops. Beautifully blended, golden with a well-balanced finish, Down Down is a true Herefordshire Medium Cider. Drawing on generations of heritage and expertise Down Down is made on the Celtic Marches Farm with the finest fresh pressed fruit. Down Down is a bespoke cider of distinction that offers a refined pedigree based on character and tradition - qualities that define Status Quo. Sweden Rock Festival, founded in 1992, is the largest rock festival in the Nordic region. Held annually during 4 days in early June, the festival promises to fill your head with rock. Rumbling smoky notes are offset by the elixir of misbehaving punchy hops. Citra and Magnum hops to the front, with Carafa Special 3 Malt and Pale on the baseline, this is our biggest and most powerful creation to date. The band wanted to create a 'palate crusher' and that's certainly what has been delivered. A beer for enjoying slowly, letting the bombardment of flavour and intensity hit your tongue and explode with every sip. Mastodon is an American metal band from Atlanta, Georgia, formed in early 2000 and is composed of bassist Troy Sanders, guitarist Brent Hinds, guitarist Bill Kelliher and drummer Brann Dailor. Many of their songs feature progressive concepts and unique instrumentation with a mix of clean vocals and harsh screams. HALLOWED – a new Belgian style beer from IRON MAIDEN & ROBINSONS. "My advice is — approach it with caution. I mean, wine is deceptive, anything can happen." / Lemmy, Godfather of Rock and Roll and singer in Motörhead. This bomber of a Shiraz has a deep red colour with an attack of aromas of dark berries like black currant and blackberry. Soft tannins combined with spiciness makes this wine perfect with game, red meat, pasta or any head banging opportunity. Even if the music makes you hot and sweaty, try to serve the wine at cooler temperature like 16-17°C. This Sacrifice Shiraz has a deep red colour with aromas of black currants. Soft tannins combined with a pleasant spicy aspect make this wine perfect with game, red meats, pasta or any head banging opportunity. 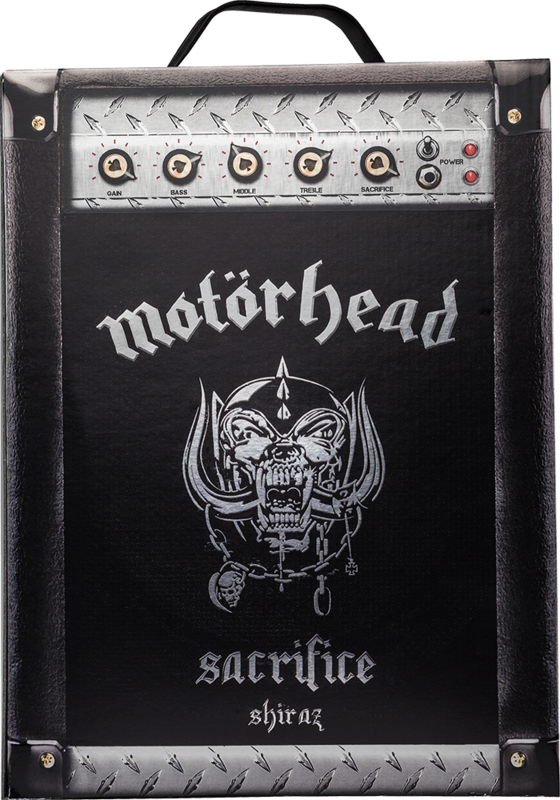 We present the amplifier for every head banging opportunity! Who said Rock'n'Roll can't be pink? This Motörhead Shiraz Rosé, is the perfect partner for summer festivals as well as the hot & sweaty rock party. It's a fresh and generous wine with fruity flavours like raspberry, ripe strawberries and you can also find some blackberries in the taste. Could be served well chilled on its own with just some snacks or together with salads, cured meats, grilled fish and to food with some heat. Turn it up and cheers! The wine is as uncompromising as the band. After a couple of Seasons in the Abyss, it has an undisputed attitude and a soft nose of dark berry fruits with oak and spicy nuances. Fresh fruitiness, smooth tannins and well-structured with subtle notes of oak, showing true Divine Intervention. Best company for the wine comes as no surprise, enjoy it while head banging, riffing or with food, friends and great music. Reign in Wine! Motörhead Premium Dark Rum is made out of the finest selection of ex-bourbon barrel aged Caribbean Reserve Rum. The premium rum is created as a solera blend with rums of different ages up to 8 YO. to maximise the taste experience. A pure and clean Vödka for all metal heads. Mix it with whatever you have at home... or drink it like a schnapps! This Motörhead Vodka is a premium vodka made from 100% locally grown wheat from Sörmland in Sweden. It is distilled and bottled at The Malmköping New Distillery. The taste is rich, full and complex. It has been "topped" with a twist of grain to get a round and soft character. The unique water in the vodka comes from Malmköping in Sweden and retrieved from a ridge linked to Bergslagen. This one goes down easily, without ice but do not forget the music and turn it up to 11! Motörhead whisky is a limited edition Single Malt Whisky with an oaky and slightly fruity character, characterized by ageing five years in new American oak barrels, where parts of the whiskey has got a final touch from oloroso oak barrels for the last six months. The alcohol strength sits at 40% and the whisky is cool filtered, so no cloudiness should occur in the bottle or the glass, if the whisky is served at a lower temperature. In summary this becomes an enjoyable, easy to drink and easy oaky and spicy Single Malt Whisky. On December 2nd 2013 "The Holy Spirit of Sweden Rock Black Label" is listed in 260 Systembolaget stores. The Black Label has the same smooth and well balanced character as its precursor. Tempting sherry-sweet malty tones in combination with delicate smokiness on the nose that leads into flavors of maltiness, smokiness and sherry sweetness. This is followed by hints of dried fruit, vanilla and cinnamon to tempt your taste buds further. The Holy Spirit of Sweden Rock Rum Solera 8 YO is a complex premium rum from Barbados. The rum has been stored for at least 5-8 years in 200 litre American oak barrels previously used for storage of Bourbon. As the rum is stored in Barbados where there is high humidity and an average high temperature of about 30 degrees Celsius, results in greater than evaporation than for example Scotch whisky. With evaporation rates of about 5-10%, compared to around 2-4% for Scotch, this results in less rum left in the barrels with greater flavour concentration and intense oak character. The taste is spicy with barrel character, hints of dark chocolate, brown sugar, vanilla and dried fruit. Legacy of Kings releases in a limited edition package, which means that this edition will be a truly unique item to have for all who loves HammerFall. Legacy of Kings is a fine, smokey, well balanced single malt whisky with a unique touch of sherry finish. Thåström’s Spanish Brandy has been stored in American oak barrels for over 12 months and has a soft and well balanced taste with an intense aroma of vanilla and cinnamon. The drums have previously held Oloroso sherry , giving another dimension to the drink's aroma and flavor. Joakim Thåström became known as the charismatic singer of Ebba Green and later Empire. His first solo album " Thåström " contained songs that have become modern classics like Karenina and All Want To Heaven . Thåström himself wanted to go to a harder sound which was reflected on the second album xplodera mig 2000 and the new band Peace Love & Pitbulls that made the industrial rock on three albums . His solo career resumed and have placed Thåström as one of Sweden's greatest singer with the album ' Skebokvarnsvägen 209 ', ' Love is for them ' and ' Arm yourselves with wings ' . He is current with his new album ' Den morronen ' which was released on February 11 , and was hailed in unison by an impressed critics . The basis for the Sweden Rock 2015 Limited Edition is an elegant, unsmoked Mackmyra whisky that has aged on ex-bourbon barrels since 2008, blended together with whisky aged on Swedish and American oak barrels that previously contained wild raspberry wine. The result is a powerful whisky with notes of berries, raisins and vanilla. Imperial has a great balance between sherry and vanilla notes with both nuttiness and raisin sweetness and a long, pleasant after-taste. With 18 years in cask, it’s an incredibly well-balanced, elegant and smooth whisky that band have chosen.